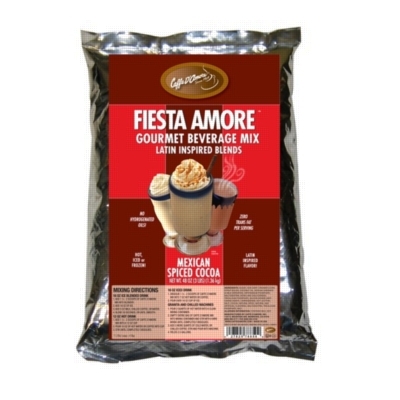 For over 40 years, Caffe D'Amore has launched innovative new product lines. Among these products is the decadent line of Bellagio Cocoa Powders and the Fiesta Spiced Cocoa. Purchase this decadent Mexican spiced cocoa in a 2 lb. bulk bag. INGREDIENTS: Sugar, Non Dairy Creamer (Corn Syrup Solids, Coconut Oil, Sodium Caseinate, (a milk derivative), Mono- and Diglycerides, Dipotassium Phosphate, Natural and Artificial flavors, Silicon Dioxide (anti-caking agent), and Soy Lecthin), Natural and Artificial flavors, Cocoa Processed with Alkali, Maltodextrin, Tricalcium Phosphate, Salt, Caramel Color.